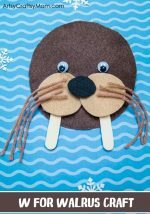 This World Oceans Day, let’s learn about the creatures that live there with some cute ocean crafts for kids! Packed with fun little facts on different ocean creatures! As kids, we learn about the various continents and oceans, their names and geographical positions. But an ocean is so much more than just a name! It’s an entire world out there, with all kinds of creatures that we know of and many that are still unknown. However, besides those naturally occurring ocean creatures, new stuff has begun to appear in the water. Plastic bags, bottles and all kinds of trash are now crowding our beautiful oceans, and the main casualties are the poor creatures that depend upon it for survival. The problem has become huge, and it’s not something that can be ignored. If you’re wondering how you can help, here are some tips. Cut down on your plastic usage and recycle rather than throwing away. Educate your kids about the same and teach them how all this carelessly flung away trash is endangering lives. Kids may be able to absorb the message better if they know who exactly we’re hurting by polluting our oceans. And that’s why we’ve got together some easy ocean crafts for kids, based on different ocean creatures – whales, sharks, crabs, octopuses and many more! And we’ve peppered the crafts with some fun facts, which will hopefully encourage them to learn more! There’s just one way to have the largest mammal in the world sitting in your hand – by making a craft of it! This Origami project is easy enough for beginners and a great way to learn about the majestic blue whale. Fun Fact: The tongue of a blue whale weighs as much as an elephant, and can hold an entire football team on it! I admit, the first time I heard of a puffer fish was through a cartoon! These little puffy creatures are guaranteed to interest kids, so let’s learn with a bright and colorful craft from Buggy and Buddy! Fun Fact: Most puffer fish contain toxins that are deadlier than cyanide, with just one puffer fish having the ability to kill 30 adult males. These paper cup octopuses are the perfect addition to your ocean diorama or small world play. 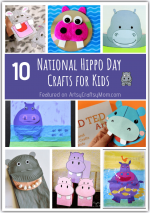 You can also use paper cups of different sizes to create an entire family of these fun creatures! Fun Fact: Octopuses can change the color of their bodies in just 0.3 seconds! They often take on colors of other ocean creatures or plants to blend into the scenery. 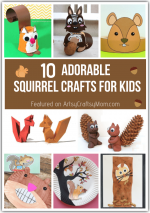 Got a preschooler who wants to craft with his big sister? No problem, A Little Pinch of Perfect has the perfect craft for him! All you need is colored card stock and lots of buttons to create some unique starfish! Fun Fact: To eat their food, the stomach of a starfish comes out, digests the food and then goes back into the body! Sharks may give you the chills, especially if you’ve watched Jaws! However, this shark craft made with an old CD is thankfully much friendlier, not to mention good looking! Fun Fact: Despite their ‘killer’ image, sharks across the world kill only about four people a year. On the other hand, humans kill about 100 million sharks a year. Most of us are unlikely to know how a jellyfish looks like when it’s happy, sad or surprised, but we can imagine! This cute craft from Non Toy Gifts gives us some expressive creatures, and you can make them display any emotions of your choice! Fun Fact: Jellyfish can clone themselves. When cut into two, each piece of the jellyfish can regenerate, creating two new creatures! One of the best parts about visiting the seaside is gathering sea shells. And since no one is selling sea shells by the sea shore, we’ve gone ahead and made our own with paper plates! Fun Fact: Most shells open to the right, which makes left-opening ones extremely rare. Due to this they are in high demand among collectors and also have several fakes! There are just too many fish in the sea, and making a craft for each one of them is impossible! So we’ve gone ahead and made a rainbow fish, to represent all the various species in the oceans – both known and unknown! Know how we often tell people ‘You rock!”? Well, now you can say that to a crab! 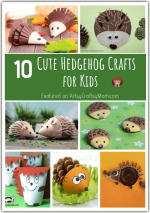 No seriously, Kids Craft Room has a cute and easy crab craft for kids that’s literally rocking! Fun Fact: Among all ocean creatures, crabs can live in more different places of the sea – under the ice, volcanic vents, on land and even on trees! An x-ray fish is not your average aquarium fish! It’s got a translucent body, which helps you see it’s backbone, thus giving it it’s name! Fun Fact: X-ray fish have incredible hearing, thanks to an internal bony structure that picks up sound waves. Yes, we have already featured a jellyfish craft, but considering how awesome they are, having multiple crafts is not too much! Fun Fact: Jellyfish have lived in oceans for millions of years, even before dinosaurs!! Introduce the little ones to ocean creatures with a cute under the sea printable! They can learn about sea animals, shapes, colors and have fun with play dough! Plus, there’s a little mermaid in there too! Fun Fact: The word Mermaid is taken from ‘Mer’ meaning sea, and ‘maid’ meaning woman. If you’ve been learning a lot about ocean creatures, maybe it’s time for a game! This fun fishing game promotes motor control and hand-eye coordination, making it great for preschoolers. Fun Fact: The world’s fastest fish is the sailfish that can go from zero to 60 mph in just 2.6 seconds! Seahorses are truly unique creatures – they look like horses and live under the sea! 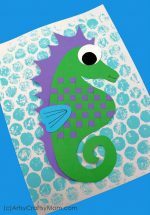 Get the kids introduced to paper weaving techniques with our realistic looking seahorse craft. Fun Fact: Seahorses don’t have stomachs, so food passes through their digestive systems pretty fast. This means that they have to keep eating to stay alive. Now that we’ve learned about individual ocean creatures, how about putting them all together in their natural habitat? This ocean drawing prompt is a free printable and gives kids a basic background to work on, while offering enough space for their favorite ocean creatures. Fun Fact: Experts suggest that there are still millions of species of ocean creatures yet to be discovered. Oceans also contain more historical artefacts than all the museums in the world! Oceans are just amazing, aren’t they? Not only do they occupy 70% of the earth’s surface, they also provide 70% of the oxygen we breathe! Come to think of it, they are life-supporting in more ways than one! 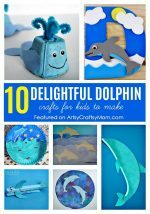 So try out these ocean crafts for kids and learn some trivia along the way. You never know, a fun fact might prompt your little one to learn more about an ocean creature!